Waking on the morning of the fixture to a very heavy frost, it was extremely fortunate that a late push back had been arranged. Not until the pitch was inspected at midday was it certain that the game would go ahead. As it was, the air temperature was barely above zero when activity finally got under way! Opening in sprightly fashion, LX moved on to the attack and Barry Sewell, guesting for the South Lakes side was immediately in action. As the sparring continued both goals were under threat but LX were sound in defence as David Read and Gurney White got to grips with the conditions. As the half progressed, Frank Hardy was finding space in midfield, well supported by David Margerison and Bill Pickersgill. The deadlock was broken on 20 minutes as South Lakes moved onto the attack. As the move broke down a quick ball forward caught the defence napping and Graham Martin made the most of the opportunity wrongfooting Barry Sewell as he guided the ball into the right hand corner of the goal. This unexpected reverse concentrated the minds of the opposition and the defence was hard pressed to hold the opposing forwards. Eventually the pressure told and a sweeping move down the right resulted in a short corner. Although the initial shot was saved, a poor clearance resulted in the loose ball being despatched into the goal. The half time break enabled the participants to warm up by lacing their liquid intake with a shot of ‘Jamesons’ thoughtfully provided by Andy Holden. The second half opened with South Lakes moving purposefully upfield probing the LX defence, but with a moustachioed Gilbert Grace alert to every move chances were few and far between. LX continued to threaten with Brian Walcott and Laurie Alcock on the wings getting good service a further score was on the cards. Unfortunately it was South Lakes who moved into the lead on 43 minutes when another sharp break caught the defence off guard and the centre forward took full advantage with a firm shot. As the temperature dropped and players tired LX struggled to get back on terms and almost went further behind when a good chance flew past Mike Fripp’s left hand upright. Although this will go down as a loss either side could have won what was a very even contest. After thanking the Umpires, both sides retired to the hotel bar in true LX style. This was a very successful attempt to arrange a match which would enable seniors within the club to match their skills against ‘sensible’ opposition. 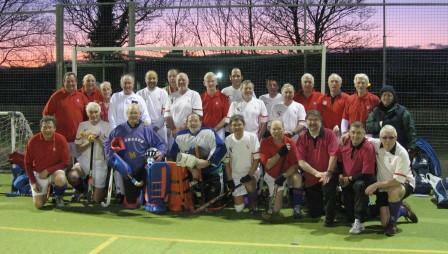 The game was played in a really good atmosphere and was thoroughly enjoyed by all who took part. A first class meal was enjoyed by some 20 wives and members and Graham Martin gave a generous vote of thanks to Andy Holden for organising yet another top drawer event. Umpires; D Rhodes and N McKenzie.